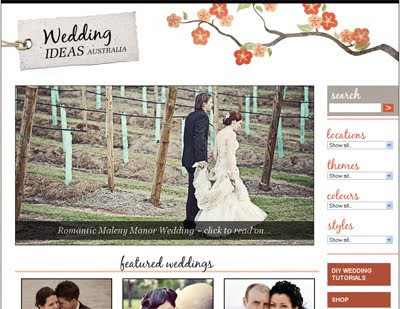 I am so proud to introduce you to my latest online project, Wedding Ideas Australia ... a searchable collection of real Australian weddings categorised by location, colour, theme and style. There are lots of inspiring weddings featured on the site, from elegant affairs to very casual garden weddings. Brides/grooms share with you the places that they sourced all their wedding details from, as well as tips for keeping it budget-friendly, eco-friendly, and handmade. I hope to be able to show that you don't have to spend a fortune or conform to a particular style, to have a beautiful wedding. And I encourage you to send me your wedding pics (and those of your friends too!) to share on the site. Please pass the site on to your engaged friends, or just have a look through for some beautiful colour palettes and interesting craft ideas. Let me know what you think! Congratulations Steph on this new venture. The website looks great! Wow Steph - you go girl! Congratulations, I'm sure it will be a huge success. Thanks so much Thea, Kim, Mandy and Lisa. I've had such a great response to the site already... I guess it's striking a chord! Congratulations on such a beautiful website! Thank you for including us and your very lovely comments. I have forwarded the website on to everyone I know! Great website, very informative and stylish!